Solve the cube layer by layer, working first on the bottom, then middle, and finally the top layer. In contrast to 'standard' layer-by-layer methods, one vertical edge consisting of three cubies is left unsolved until the final steps. use for all sorts of simple situations, preparations, etc. The Y-move fits very naturally into the free-column strategy, since we have a Y-shaped work space available for many of the solution steps. Second, our strategy focusses on either edges or corners in each step. 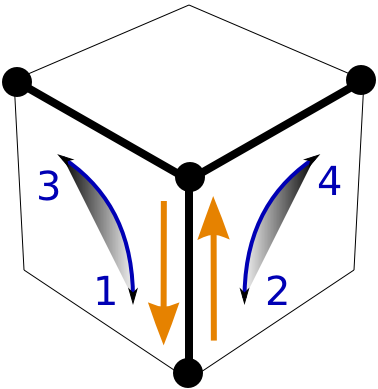 Frifir performs two characteristic manouvers for the two type of cubies, and we can focus on just one of them to achieve our goal (say cycling edges, or swapping corners). Leaving a column as "work space" is a neat bit of cleverness that I first saw in the Wikibook-2008 solution for beginners. 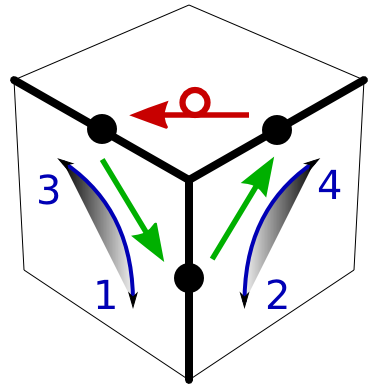 The free-column method gives some additional manouvering space, which is convenient since it saves moves that would otherwise be necessary to return the cube to the solved state. The Wikibook-2008 solution also used the Y-move, with extras for the final edges. Corners were positioned with a different set of moves that I mention later. Layer-by-layer is by no means the only option. You can solve by blocks. There are edges-first methods, and corners-first methods. If we leave out Step 2 above, it is straightforward to obtain an edge first method using the very same set of moves. In a way, layer-by-layer with a free column is halfway between the original layer-by-layer and edges first methods. Ours is a beginner's method. There are rather few things to remember. A beginner's method like ours solves the cube in many small steps, mostly one cubie at a time. Advanced methods save moves by doing several complicated things at the same time. Some methods are called simple or labeled for beginners because they only use 10 or so algorithms. Efficient, sophisticated methods easily use 50 or even more different algorithms. It depends on you what you consider simple, and whether memorization matters to you. In fact, our method is rather special in that it makes do with just one sequence. However, we really have to look at the full picture in the end before making claims about simplicity.